Cid is a stunning natural harbour with several small sandy beaches, a popular first and last night anchorage for bareboats and well maintained sites for campers, Cid is a excellent spot to really relax and wind down enough activities to enjoy for a day. 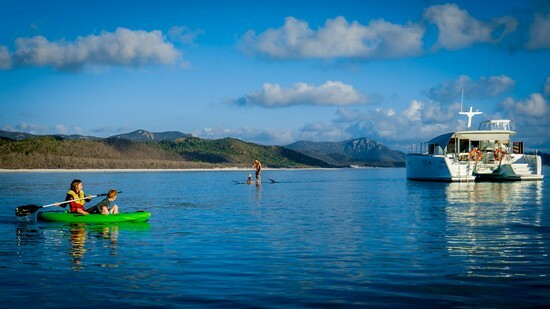 Up early on Day 7 and a morning stroll around to Dugong Inlet (if you didn't partake yesterday) to work off the skippers cooked breakfast, take in the beautiful fern grove or explore the many beaches by kayak or paddle board. You can spend a whole the day exploring Cid Harbour or drop a line to see if you can hunt up some dinner. Cid Harbour is home to several bays, you can anchor in Sawmill and explore by tender or kayak if you hired one. Joes beach, Naris Beach and Dugong are all great little spots to explore. Make time for a bush walk to Whitsunday Peak (437 mtrs) is a fantastic hike for sunrise or sunset (5kms return). Take water and a pack up, comfortable walking shoes are recommended as the hike can be challenging in places, however the 360 degree views are well worth the effort. For the less adventurous a shorter, flatter walk exists from Dugong to Sawmill and return. If your walking at sunset take a torch as it will be dark on the hike back to your boat! Leave the lights on on board so you can spot your boat from the top!